This is one of my pet hates, and I am not sure I have blogged it before, but this is a pet hate that pre-dates my blog by many years. There is a wikipedia article on this [here], and it is interesting reading. What is a crossed zero? The basic problem is fonts, usually very low resolution fonts such as 5x7 or 5x9 pixel based character sets on simple displays, which insist on making the zero character distinct from the letter "O" but making the zero have a diagonal line through it. However, the issue is slightly more than just a crossed zero. As the wikipedia article points out, IBM chose to cross the letter "O" and leave the zero as is, but other computer systems (ICL being the main one I think) crossed the zero. Some even dotted the zero or used other ways to tell it from a letter "O". Whilst the wikipedia article does state that the idea of crossing a zero is older than computers, the main issue does indeed come about with dawn of computer systems. I am old enough to remember a mechanical typewriter - one that did not have a zero, because you had the letter "O" and used that. Indeed, I think it did not have a one either as that was a lower case "L". For type written documents, just as hand written documents, the use of digits was almost always obvious by context and the distinction of zero and "O" or one and "l" did not matter. As I understand it, historically, some writing systems did not have separate "digits" at all, and used letters. However, for computers it matters, so we now have zero and the letter "O" very clearly different characters in the character sets like ASCII. 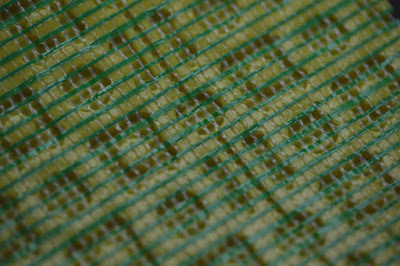 In the early days of computers one would have "coding sheets". I actually used these in secondary school to submit CESIL code to be put on punched cards and submitted to a mainframe. This was before the school had a computer. This is when I first met the crossed zero. The people punching the cards had no real idea of what they were keying (as was very apparent a week later when the code run print results came back) and you had to have a way to be clear if you meant zero or "O". 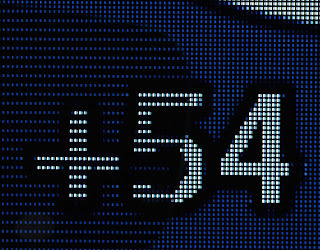 When display technology started to allow matrix character sets (5x7 for example), the zero was coded as distinct from the "O" and had a line through it. As the wikipedia article points out, this has a lot of problems. For a start, even in American character sets the crossed "0" looked a lot like an "8". But in some languages there is a crossed "O" letter that is a distinct letter "Ø". The wikipedia article highlights several more clashes as well. I used to work for Nokia, and I was a key developer on one of their last analogue mobile phones. I did a lot of the UI work, even drawing the new LCD layout myself. It was a two line display with 5x7 characters, and used a standard display controller which had a 5x7 font. This was before any "text messages" were possible, and the display was mainly for showing phone numbers. If I recall it was limited, maybe 2 lines of 8 characters or some such. So was used for menu items as well. The default 5x7 character set had a crossed zero, but I insisted that this was wrong. This was not a coding sheet for entry in to a computer, but a consumer device - shown to people who had never seen a crossed zero and had no reason to differentiate a zero from an "O" anyway. I did my own tests on those with poor eyesight and found, as I expected, that 0 and 8 looked the same. At one point the other s/w developers argued and insisted that they always crossed their zeros, and it was "normal". Apart from the idea that s/w geeks in a mobile phone company were in any way typical customers, I challenged them - we had log books (paper) on which we wrote notes and I said "show me". Without fail they all found that they were writing zeros in their log books without crossing them. I won that argument. Oddly, marketing were not impressed with me. They finally agreed for one model in one country, they would allow me to replace "0" with "O" on the display. This was, oddly, the UK, not countries in which Nokia marketed phones that used a crossed "O" character "Ø", which is crazy logic in itself. The only real vindication of my stance came in a review of the phone, where they were really impressed with how much bigger and clearer the display was than the previous model. In reality the display was identical in size, but I had instigated two changes. One was the uncrossed zero, and one was spacing out UK phone numbers (it was the time of OFTEL Phoneday, and I was hassling them over number layout rules). The result was that phone numbers were indeed massively easier to read. Times have changed, well, sort of. For a start, mostly, people are not looking at old 5x7 character sets, and have much higher resolution in which to express the subtleties of different characters. Most fonts sensibly have a different style of "0" and "O". Indeed, fonts often try to make all digits the same size (not always, especially for "1") and the "O" is wider. However, the crossed (or dotted) zero is still with us, and is a legacy that hangs on in there. Why did I post this now - well, setting up security for the man-cave, and the camera overlays the time and date. It has dotted zeros. Why? Why? Why? Context if everything, and no reason to make it harder to read and confuse "0" and "8" is there? Can we please kill the crossed zero - it either needs a subtlety different appearance or is clear from context whether a "0" or an "O". I noticed this new law that came in to effect in May this year [here]. On the face of it, it simply makes it an offence to sell specialist printing equipment to people where you know they intend to break any law using it. It allows for a 10 year prison sentence and/or fines. Well, I think not. Even if it works entirely as intended then what really is the point of this law? How would anyone selling such equipment actually "know" that the customer is intending to break the law? I cannot see any requirement to "make enquiries" as to the intended use of the equipment. I cannot even see a "might reasonably expect that the intended use is not lawful". The wording is that the seller "knows" the equipment will, or is intended to, be used to break the law. How would you prove, beyond reasonable doubt, that someone selling a printer actually knew the buyer was intending to break the law? However, in my non legal opinion, the drafting of this is really not very good leading to several other problems. What is a specialist printer? I bet you would assume that it is things like the SIM card printer I mentioned, which can even do "invisible" UV printing that only shows under a UV light, and can have attachments to include a hologram laminate layer. Clearly that is a tad "specialist". However, the definition covers printers that can do any ID documents, or Travel documents, or Entry documents. Actually, it is designed, adapted, or simply "capable" of making a relevant document. Even so, that sounds like "specialist" equipment, i.e. stuff that could print a driving licence or passport. Well, yes, and no. It goes on to describe these, and includes any document that is a travel or entry ticket. So if you can print off your flight eTicket on a normal printer, or print the entry ticket to the beer festival, on a "normal printer", then that means every normal printer is a specialist printer because it is "capable" of printing such a document. OK, many such tickets have a bar code, so maybe the old daisy wheel printer I have in my loft would not count (though it would be capable of printing a QR code using full stops). Also, the intended criminal use just has to be something using the printer, it does not have to be something using the printer to make these documents. It specifically says any criminal offence under UK (or non UK) law is covered. So if a printer is "capable" of printing any entry or travel ticket, it is covered, and if the seller knows it will be used in an way to commit any offence then they are guilty of an offence by selling it. If some company ordered a printer using an order form or letterhead which did not include the necessary details as defined in the Companies Act (e.g. company registration number and registered office), and perhaps when ordering or enquiring they even said to the seller that they need a new printer that can print their letterheads, like this one. Then the seller would know that they intend to break the law (Companies Act) using that printer. It is a printer capable of printing entry or travel tickets, so is "specialist printing equipment", so the seller could get a 10 year prison sentence for that? It gets worse, the specialist printing equipment not only covers any normal printer, but also "any device, machinery or apparatus and any wire or cable, together with any software used with it". So just selling software, or a USB lead, that is used with a normal printer to someone that you know is intending to break any law using a printer makes you a criminal. Even worse, it covers materials used to make such documents, so if you sell paper you could be covered by this! I can't help feeling that our government like making laws that can, in fact, encompass almost any citizens, just in case they feel like locking someone up. Or, perhaps, conspiracy theories aside, this may be an example of how technically inept the government are, even in areas as simple as printing! This is the first day that I really think that the garage conversion project is actually starting - workmen have been here all day clearing out the old dry lining, and stud work, and getting it ready to start work on Tuesday. 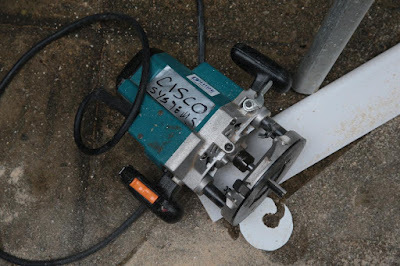 Of course, the BT fibre runs directly through one of the old bits of stud work, which is a slight snag, but we can sort that on Tuesday. The wasps nest was old/dead, thankfully. The garage door still opened, but no runners, so left on until Tuesday. 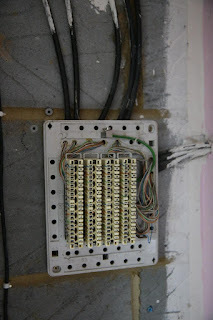 I have ripped out all of the old cabling, some of which was installed around 17 years ago. The old worktops and benches were dismantled, and a whole skip was filled today. So, picture is boring today - looks like a garage again - and "no" to each of my kids that has said "we should make it a garage again", seeing as they all have cars. 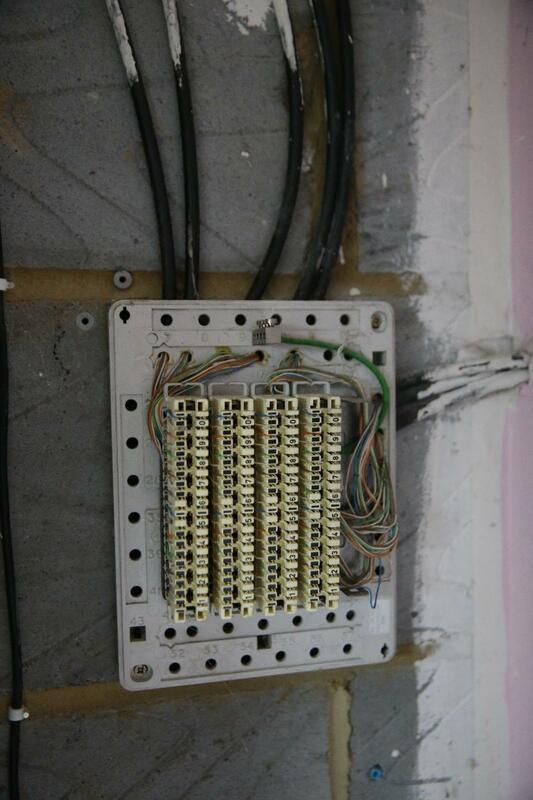 I don't recall the date, but when we first moved in to this house I personally installed some cabling. Internet back then was dial-up which I had just managed to progress to ISDN. I installed good quality 5 pair external jelly filled telephone cable to every room in the house with a double phone socket initially. This involved a lot of crawling through the loft, drilling holes, and hammering in cable clips whilst at the top of a ladder. It was hard work. I neatly terminated all of the pairs on a 40 way DP, so 8 rooms each with 5 pairs. It was very tidy. My kids all had an analogue phones with their own personal direct phone numbers in their rooms. The numbers are still used by some of them now, but VoIP and Mobile connected. 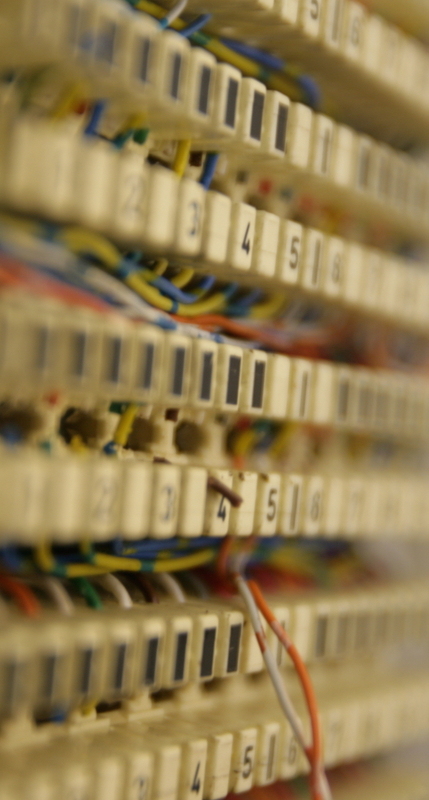 Over the years the use of the pairs ended up being 10baseT and even 100baseT as well as analogue telephone. It was not until much more recently that I ran actual cat5 from the loft down to every room along with multiple coax for satellite TV which is what we use now. 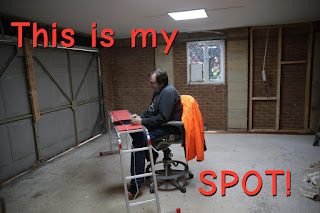 Much of the original wiring has been taken down off the walls, and all of the old sockets removed, but until today that DP still remained on my garage wall - neatly terminating all 40 pairs but connecting them to nowhere. Now, I am tidying up, clearing everything out of the garage I don't need, and removing all of the old cabling, so it has finally been removed. 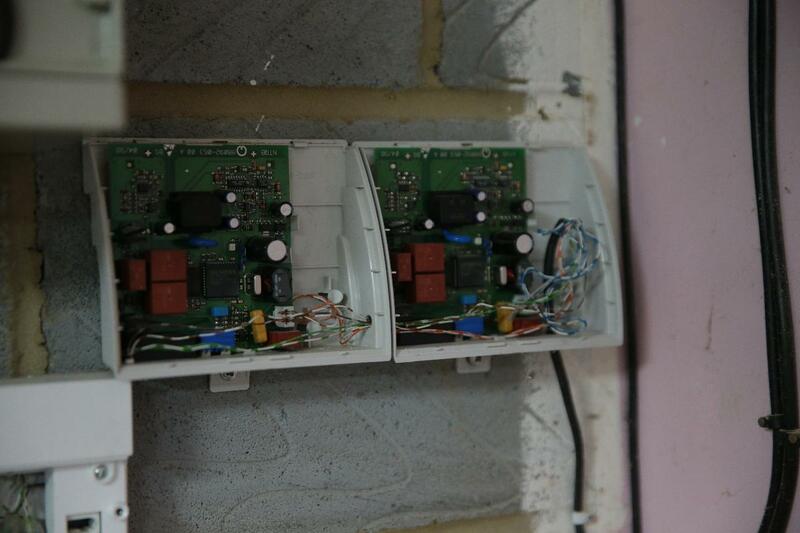 I have also ripped out the old ISDN sockets and the old DSL/phone sockets. All ready for the builders to start, even if that is delayed now to next week. I have changed a switch to a new HP 1820-24G, which seems quite a nice switch. But I started seeing rx packet errors in the stats. Now, there is a fibre involved in the uplink on this, and I had moved the endpoint of that fibre to the loft and put an extension fibre patch lead in line, so naturally, seeing rx packet errors, I assume I have screwed up. I have spent hours on this, new fibre patch leads, cleaning fibre ends, and so on. No joy. Still packet errors. I am coming to the conclusion the switch is lying to me, especially as, finally, it is getting to the point that it shows 1/3 of all Rx packets are in error, and that would be visible in other ways. Pings are clean, and no signs of issues with traffic apart from the reported errors. But it is not as simple as Rx packet errors. First off, I did not have a lot on the switch - an "uplink" on port 24, and a "downlink" on port 22 going to the switch in the loft and APs and a load of other stuff in the house. What was especially odd is that the error count for Rx errors on both (port 24 and 22) stayed the same! So, I moved the uplink from 24 to 23. The count on 23 started going up but the total of 23+24 was the same as the Rx errors on 22!!! I did the same the other way, moving 22 downlink to 21, but again the total Rx errors from the downlink port was the same as the Rx errors from the uplink. This really made no sense, and the error rates were low. If I disconnected the downlink I did not see any errors from the uplink. I had an AP and a laptop connected on another port so could confirm all was working. It seemed to matter for the Rx count on the uplink as to whether the downlink was connected. 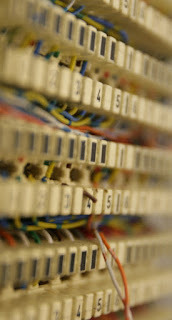 I spent ages checking and re-crimping cat5 cables, and cleaning the fibres, and changing patch leads and so on - no luck. 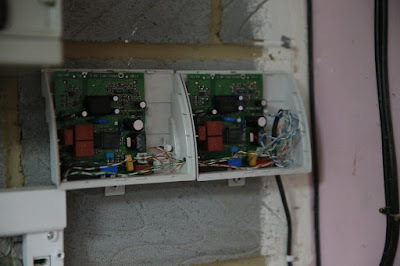 Eventually I decided it was clearly the switch being silly, and went on to the other job - reconnecting my neighbour on port 1 on the switch!. This involved a lot of messing about drilling holes and James crawling around in the loft to see where I was poking it through and so on. Eventually I connected port 1. Now things changed, the uplink Rx errors went through the roof, but the downlink did not - it was still low, and was no longer the same as the uplink. Port 1 showed no Rx errors. But if I disconnect port 1 then the uplink Rx errors go back as before, quite low. If I disconnect port 1 and 22, then the uplink errors stop completely. I have to say WTF? Update: If I send packets with no VLAN tag that are 1500 byte payload (so 1518 total) then no errors. If I send packets with a VLAN tag that are 1500 byte payload (so 1522 total) then errors count up. This is even when the switch is set to allow jumbo frames. A clue is that if I set not to jumbo it says the MTU is 1518 on all ports, not 1522. It is clearly a bug in the switch. I have a friend who has a lock PIN on his phone of 0000. What does that mean? Well, for a start, it means he does not really care too much about the data on the phone being used by someone else, but it means more than that. He has in fact "locked' his phone. Someone trying to get in, even if they know or guess 0000, is breaking through that lock. I think morally, and possibly even legally, "breaking in" is massively different to being let in. The lock says that you are "not authorised", so things like Computer Misuse Act kick in if you go passed that point. If someone wanders in to your house through an open door, it is not the same as someone using a very simple lock pick to get passed a really poor quality lock and opening your front door. I started wondering if this had wider implications. E.g. if someone like Apple have a backup of your data, including a backup of your private keys used by iMessage and the like, protected by a relatively low entropy key like a 4 digit PIN for example, what happens if asked for that data. Well, they can honestly say they do not have the data as it is encrypted. I am not sure if existing laws allow authorities to request that they "hack" what they have (e.g. trying all 10,000 four digit PINs). Expecting a company to hack in to their customer's data would be a heck of a step legally and morally, but having a good reason not to disclose it because of the protection may be enough? We can only hope that laws do maintain some concept of boundaries in the future - not just in the real world, where it matters if you invite a bailiff in to your house or he forces his way past you, and the same in the computer world where it matters if you break passed a 0000 PIN or do not try to. The builders will be starting a bit later, and the utility room is not quite finished yet (couple more hours work). Mace has spent some time sorting out the worktop for this, and it is looking pretty good. 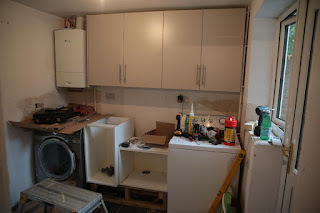 We need to attach sink fittings and taps, fix it all down, sealant, oil the worktop, and do cupboard doors, board the plinth neatly, and then it is ready to get the tiler in for the walls. The garage will sort of start on Monday with clearing the old dry lining that was on some of the walls, and getting stuff ready for Thursday. Still have to empty the garage which is scary! Only a few days and my garage project finally starts! I ordered an Apple watch (don't worry, it was not for me). Ordered on 7th for delivery on 10th, and it is for a birthday on 12th. So had allowed a couple of extra days just in case. It did not arrive on 10th, as Apple use "UK MAIL" as the courier. It was rather odd, as Apple emailed me 15:49 on 10th to say it was delayed, but the courier did not record the delay on their tracking until 19:00, which means their tracking is not as good as their reporting to Apple. What was also odd is that the courier had it down as "At delivery location" at 03:38 on 8th, which also made no sense. I contacted Apple on their chat thing, which was a pain as they could not actually tell me any more than the web site and would not call the courier or chase them unless I called Apple! Apparently the courier could not find it in the depot so would not be delivered on 11th either. Great! This meant changing plans for the birthday present. I contacted apple and cancelled the order, as their web site does not offer "cancel" as an option once dispatched. Nearly a week later, on 16th, courier site still said delayed and no more, and no refund, so contacted Apple again. They were very very reluctant to refund me. They insisted that they needed a contact number for me so they could get the courier to call me about an investigation. I had to explain many times that I had cancelled the order and the law says they have to refund me without undue delay. Their issues with the courier are no concern of mine and I am in no mood to mess about with some sort of investigation with them. The law is clear that they take risk in transport. I had to quote the The Consumer Contracts (Information, Cancellation and Additional Charges) Regulations 2013 them several times! They agreed a refund. But now, on 21st, still no refund. I have chased again and they say that the watch has only just been returned so only now will they do a refund. This is not refunding me without undue delay is it Apple!!! What is interesting is reading the regulations. Some people will know the old "Distance Selling Directive" which has been replaced with these new regulations. And I notice the new regulations have a hole in the wording. I am sure a judge would see sense with it, but still, bad drafting. Section 34 covers a refund, and (4) says the "without undue delay" part, but there is also a hard limit on the time taken to refund. This is defined by either (5) or (6) which cover two cases. The problem here is that this was a sales contract, but the trader had not "offered to collect the goods", so the 14 days applies from when I send them back. But I don't have the watch, and never had it, and don't send it back, so the 14 days never starts! Now, in my case the goods had been dispatched, but what of cases where they have not been. Such cases never start the 14 day time limit, as the goods never need to be sent back. The law has a gap. Clause (5) needs an extra caveat of "and the goods have been delivered to the customer". As I say, I am sure a judge would read that in to that clause. Even so, Apple are simply ignoring several aspects of these regulations, not "allowing" cancellation at certain points in the process when the law says I can cancel, and not refunding without undue delay, and arguing over it! You'd think someone would have spotted this hole! I have tried hard to explain the problem with government plans to interfere with strong encryption. "You may not understand the implications of the laws they wish to put in place so let me put it this way, it would make whatsapp, snapchat, facebook and even many phones illegal in the UK, so please sign..."
And for the majority of the public this is a good start. Ultimately the existing systems that do whatsapp, iMessage, FaceTime, Snapchat and so on are not compatible with the way the government want things done. At the end of the day we have to get the government to understand that there is an issue here - that trying to mess with encryption will have serious negative impact on citizens, business, and even government departments. It will create new ways that criminals can impact our lives and new ways to invade privacy. Criminals wanting to keep secrets still can as the cat is out of the bag - encryption exists, and is easy to access and use. You do not even need a computer! 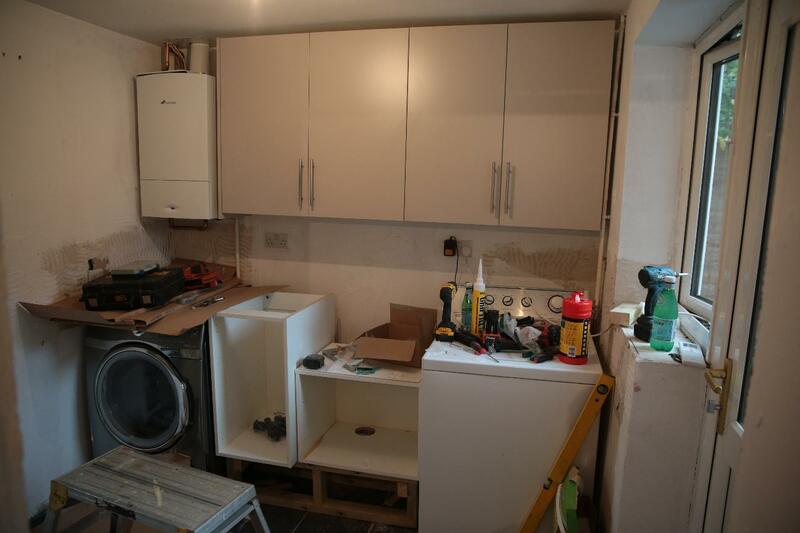 Starting to look a lot more like a utility room now, and probably would be finished if not for the plumbing. 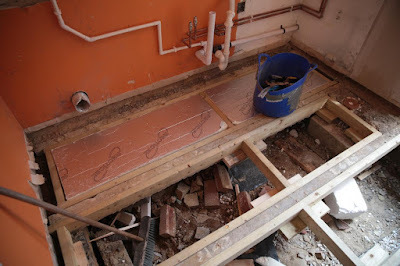 My plan is a small sink in the corner of the garage which means water and waste running on from utility room through wall. 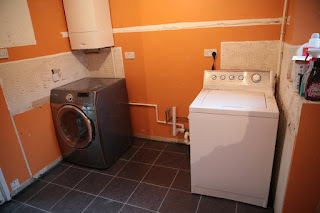 The plumbers were "We'll do that when you are doing the garage" and stopped where the sink is to go in the utility room. However, the sink is being very much built in, with a wooden plinth to get it to the height, a wood worktop over the whole lot, and fitting around the pipework. It will be almost impossible to extend the pipes to the garage once it is done, so we have had to stop and wait for plumbers coming first thing tomorrow. But it should mean all but some final tiling is finished by tomorrow lunch time, and the utility room is done - giving us just the weekend in order to finally clear the garage ready for Monday. I can't believe the garage conversion is finally going to happen. I will finally have my new office / workshop. Oh, and this is a router (pronounced "rowter"), not to be confused with a router (pronounced "rowder" by Americans). Well, Mace is really good. He's the carpenter. He came in at 9am, went through what we wanted, went down to Howden's and so on, got it all, came back and got to work. We now have some skirting board, the cupboard door, the new door frame, and the cupboards on the wall. 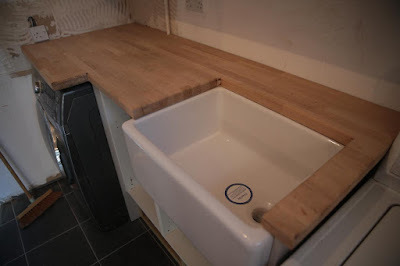 Tomorrow should be the sink unit and worktop. Really impressed. Friendly, tidy, no messing about. This is all through B.W. REED & SON BUILDERS. We can start emptying the garage now ready for work starting next week. Someone tell me why the repeat prescription form for my surgery insists I include a "message". I mean, when done on paper, no "message" is needed! I have done "Still diabetic" and "Why do you need a message?" I may have to do "This message intentionally left blank", and, of course, "This message unintentionally left blank" as well as "This is not a message, honest". I mean, what the hell is the point? Is it some sort of NHS sarcasm test? P.S. What is especially annoying is that when I do have cause to add some genuine message, it is always ignored. Apparently orange walls are a bad idea - who knew? Should have carpenter in tomorrow - not sure if doing skirting board or just measuring or what, but we need something before we can start emptying the garage. Getting close now. This only really works if I do one every day. We have tiles in the utility room - but the grouting and adhesive have to set properly - so not moving stuff out of garage yet. Indeed, we are working on skirting board and units for utility room this week if at all possible. 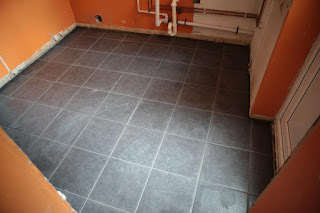 Tiler seemed to do a good job, even though we have a couple of hours of power cut during the day. The tiler has laid some sort of matting on the floor of the utility room now using some flexible adhesive. 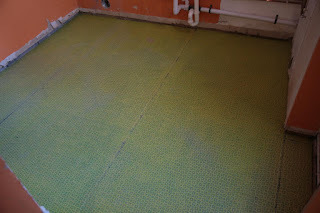 The idea is that this works well on to avoid tiles or grout cracking. Seems counter intuitive to me, but he is the expert. Tomorrow the utility room gets the tiles, and then Tuesday we can finally start emptying the garage ready for them to start a week on Monday. One day closer to the man cave! Well, the builder thinks we can start the garage a week on Monday. 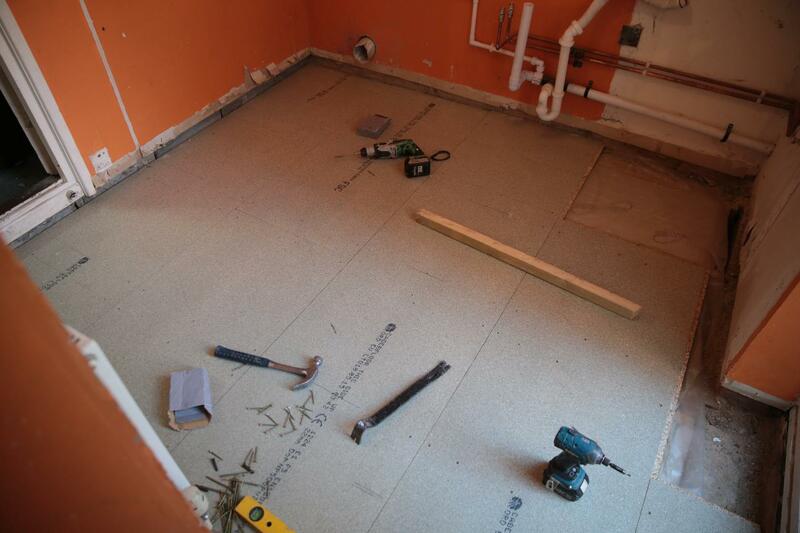 So this week I get the utility room out of the way - we have a floor, and even another layer of ply, and tiler coming on Sunday/Monday. 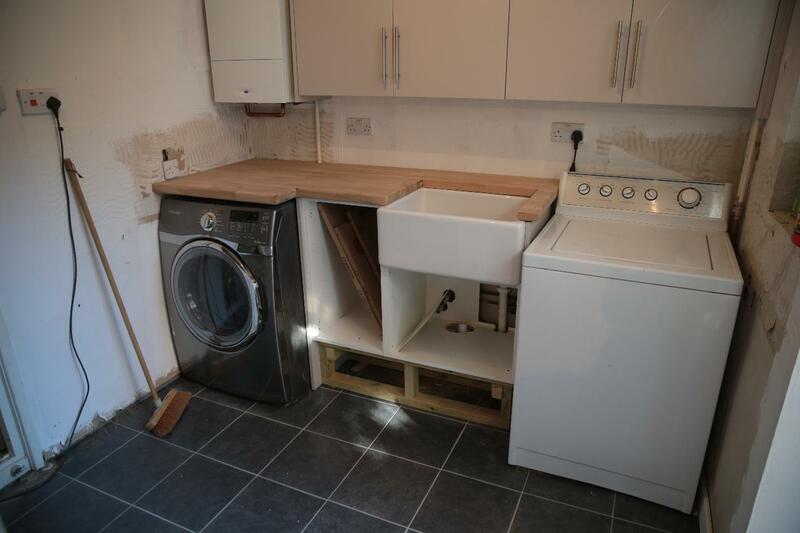 Then we can get skirting board, sink unit and worktop, and cupboards. Maybe I can get that done during the week. I go on about SFI charges, but the latest scam is BT charging "Time Related Charges" for work (mainly on FTTC line faults). We had a customer with a fault on an FTTC line, constantly dropping, many times a day. We had, of course, replaced all of the equipment and had it connected to the master socket test port (so no extension wiring), so proving the issue was with BT. BT's tests said: "Impairment in copper joint detected most likely in local network. Please continue to submit a trouble report" so we reported a fault. BT then asked us to "arrange an appointment" (not, as is more usual, a case of saying there is nothing wrong and "offering" an SFI service). So, at BT's request, we arranged an appointment, and the engineer went out. The line was off for around an hour while he worked on it. Now it is all working - no more drops. Thank you BT. To our surprise we now have a bill from BT for "Time Related Charges" for this fault report, as BT had closed it as "Customers Equipment, Error or Misoperation;Fault found on customer sited non BT maintained equipment". Somewhat odd as BT's own tests said to report a fault, and we had not approved any "Time Related Charges", and we had already eliminated all customer equipment (the same equipment still in use and working). In fact it was BT who asked us to report a fault and BT who asked us for an appointment. They took this upon themselves all the way. This is, in itself, typical of the hassle we have every day from BT. Except this time BT have charged for 350 hours of time related charges on the fault. The entire fault report end to end was only 7 days (168 hours), most of which was waiting for BT to actually go out and do something. From point of no return at start of day, to closed job, was under 7 hours. They would have had to have had 50 engineers working for that whole 7 hour period to justify this charge! The charge for this one fault repair? And BT are actually meant to be double checking our bills before we get them because of the number of incorrect charges. Odd for that one to have slipped through. Well done BT. Needless to say that this will be added to the disputes! P.S. It is probably worth explaining one of the underlying issues here. TRCs are for engineering work. Now, either the engineer did work on BT's side of the NTE (to fix a fault), in which case we do not have to pay, or they did work on the customers side of the NTE, in which case we did not request or agree the work, so again, we do not have to pay. Unless we specifically order work to be done, and pre-agree a TRC budget, and it is not work to fix a BT fault, we should never get a TRC charge whether it is £252 or £25,200. Choosing a new TV can be tricky - it is one of those things that is always moving forward and there is always new technology and something new to tempt you. So I am going to try and cover some of the things that may help in the choice, and explain some of the experiences I have had with TVs recently. I have used many TVs, from different manufacturers, and the latest is testing a 55" LG OLED HD TV. The price is perhaps the key thing for almost everyone - and typically you'll buy a TV that is just slightly more than you budgeted for as there will always be some feature that is available if you stretch that little bit on budget. One of the key factors in price is the size of the TV, and this is likely to always be the case. The other key factor is the use of latest features in the technology, but size is a massive factor. To be fair, size is often a matter of what will fit the room - a small room does not need a 65" TV, and even a large room can work perfectly well with a 55" TV. You need to consider what you can afford and how it will look. It is possible for a TV to be too big if in a small room. A curved TV is one of the latest things. It is possible with some of the newer technologies, and is an odd thing if you ask me. I could not really see the point of it, to be honest. A curved TV will almost always not be wall mountable (I know one person that has). However, the key thing I have noticed when trying one is the reflection. In my front room my seat (my "spot") gets reflection of the windows at the back of the room, and that is annoying. However, a curved TV reflects a smaller part of the room, and just by sitting slightly to the left or right I can completely eliminate the reflection of the windows. This, for me, is one of the only reasons to consider a curved TV - otherwise you hardly notice the slight curve. 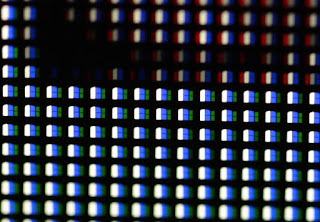 The latest tech for TVs is OLED (organic LED) which is where each pixel is individual LEDs (Light Emitting Diodes) which emit light. This products an amazing picture, and the black is black and the contrast is infinite. It looks stunning, I have to say. The only issue is lifetime which I cannot easily tell on a new TV. I am impressed with OLED (on an LG). The slightly older technology is LCD (Liquid Crystal Display). This is damn good, but confusingly we see TVs sold as "LED", which just means "LCD" with an LED backlight. 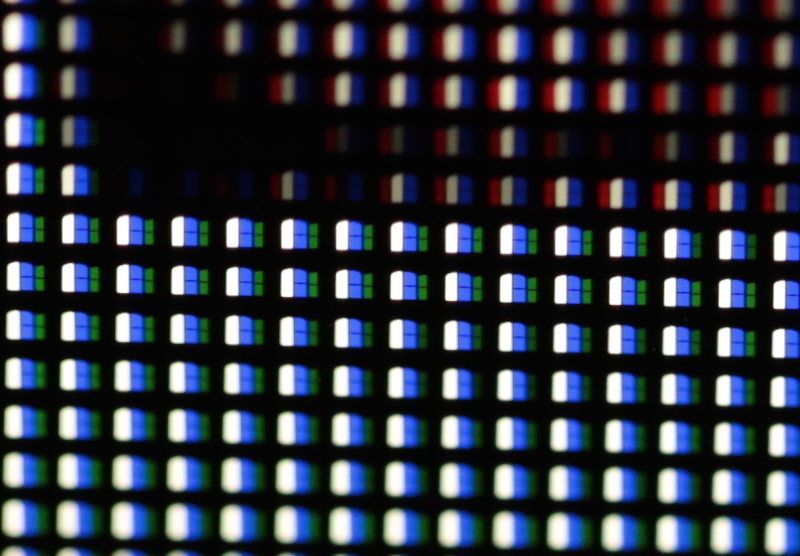 The way LCD works is you have a backlight behind the screen, and the LCD blocks some of that light. Compared to OLED this uses more power, and the black always lets some light through so the contrast is not as good. The best LED backlit LCD TVs use selective lighting behind the LCD, so that you get black when the screen (or large parts of it) are black as they turn off the back light in those areas. LCD is cheaper than OLED but not quite as good. Even so, these days, LCD is damn good. 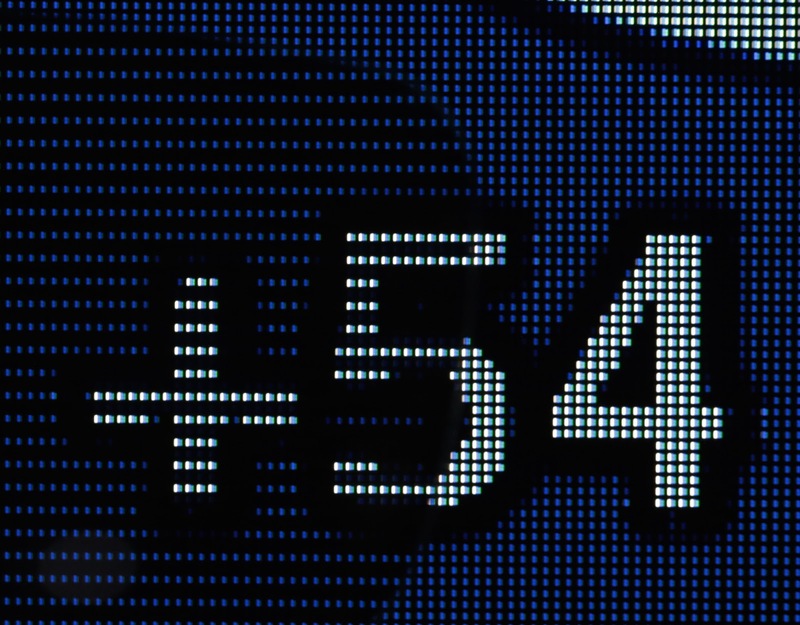 An LED backlit LCD is usually lower power and thinner than an older LCD, but not always as good in terms of quality. 3D is a nice feature, and some 3D films work really well. There are two ways to do this - one uses a fast screen changing left/right image and shuttered glasses. These are, in my opinion, bad. They need batteries that are always flat when you want to use them, and are expensive. They flicker which is annoying if you can see it. They bleed through as very difficult to make them work perfectly (each eye sees a "shadow" of the other eye's image slightly offset as a ghost image). They only work when your head is dead level. By contrast, the other method as used in cinemas is polarised glasses (circularly polarised) with an LG TV (they are the ones with the patent). Only downside is you lose every other line of the image as each line is left or right eye and fixed (see below re 4k TVs). However, the image works at off angles, has no flicker, and really works well. The glasses are cheap, light, and even have "clip ons" for normal glasses that also work in the cinema. This, for me, means an LG TV as they are the only ones with such a system of good passive 3D. Most TVs these days are HD, so 1920x1080, but the latest standard is 4k (usually 3840x2160). 4k is expensive as a latest tech, and is not typically broadcast though netflix have some 4k content and no doubt it will be the next big thing. One nice thing if you have a 4k 3D LG is you can watch HD 3D without losing lines, as every other 4k line is left/right so at HD nothing is lost (in theory, I have yet to test). I have seen 4k though, and it is impressive - I can see the difference with SD/HD but 4k is just that bit better and impressive. I don't really expect to use the "Smart" features of a TV as I will use with an AppleTv, Sky box, PC, and so on. But they are pretty good these days. The latest LG has netflix and talks to flex, and so on, so not too bad. They even have half decent web browsers these days. Beware that they log all you do back to the manufacturer (often unencrypted) so you may want to firewall them. I'd be happy if they did a TV with just many HDMI and not "smart" at all. I am no expert on sound and would connect to some external thing via optical - sorry I am not a lot of help on that. Well, for the garage, it will have to be LG (for the passive 3D), OLED (just looks so good), 4k (well, you have to), and probably 55" or 65" (big room). Sadly that will have to be curved I expect. It will not be cheap. I have raised this before, but it is worth re-iterating the stupidity of this latest tax and why I think as a "trial" it should fail and be scrapped. The basic principle is simple - OFCOM are charging for telephone numbering blocks in some area codes. It is a trial, and hence only 30 areas that are short of numbering. The charges are 10p/number allocated, but a discount of 18p/number for ported out numbers. The charge has been introduced and applied to existing allocations which have been obtained from OFCOM on the basis that there is no charge for an allocation. Making this charge only to new allocations would have the same effect of reducing unnecessary allocations and encouraging conservation of numbers but without ruining the existing business models of existing telcos. A larger telco like BT will have many blocks in each area, and they will be mostly full blocks with a final part filled block. As such they will have paying customers for the majority of number charges. However, as the charge applies per allocation (1,000 block is smallest), a small telco with only a few customers in a block has to pay for the whole allocation. This makes it harder to include the cost of the numbering tax in the pricing for the service. If it is was only "in use" numbers it would be fairer and easy to include in the pricing and business model. Given that OFCOM already have reporting from telcos (for ported out numbers) they could just as easily ask for utilisation levels and charge based on these. Conservation is discouraged for two reasons. Firstly as the charge is per allocation, it works better if more numbers are in use in each allocation rather than fewer. This means telcos will want to make incentives to get more paying customers to help cover the costs of the numbering tax that applies to the whole block. If this works that means they need new blocks sooner. Secondly, where a telco uses one of the tricks described below, to port out numbers, they reduce the bill per ported out number, and so will want to encourage more number take up and then porting so as to reduce the bill further. The Comms Act actually has a clause that specifically covers cases where the price for numbering allocation has been agreed with a telco when allocated, and prohibits OFCOM increasing that price. This seems to be a good principle and designed specifically to stop this sort of abuse and impact existing allocations. OFCOMs view appears to be that no pricing was agreed (it was not necessary as it was ZERO) but if OFCOM had agreed a price they could not have increased it. Increasing from zero seems to me to be abuse and very much against the spirit of the Comms Act and possibly even in breach of it. Making new charges for new allocations is a separate matter. 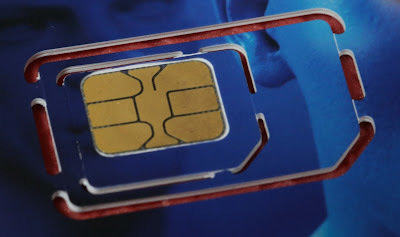 Until the numbering charge, a block of numbers is an "asset" to a telco, and a portable one. If a telco is wound up, or simply stops doing numbering (e.g. a company stops doing VoIP), then they can sell or give away their numbering blocks to another telco that will be happy to take them on and continue to provide service to existing users. One of the key things with any block is that it may have some "ported out numbers" in the block, which a telco can ensure continue to work. These are not really a money making part of the block but not a lot of hassle either, and allow the rest of the block to be used for profitable customers. Because of this number blocks would almost never be "returned" to OFCOM. However, now number blocks have a cost then they are less of an "asset", and may end up being returned to OFCOM. In that case, even if the telco returning them has no remaining customers, all ported out numbers would stop working. This is especially bad if a small telco goes bust. The ported out number users would find their numbers stop and nothing they can do and nobody they can blame. A situation which simply would not happen before numbering charges came in. We had one simple way to reduce charges - we made it part of our terms that anyone getting a number in any of the conservation areas would immediately port the number to another telco (not a related company) who would then sell back a VoIP wholesale service to us for use of that number. We set this up legitimately with a totally separate company and suitable formal cross billing for services. OFCOM have accepted the numbering charge discount with each such number being 18p/year off the 10p/year*1000 charge for the number block. This encourages us to sell more numbers in conservation areas now as each live number reduces our bill. However, by total fluke we found that the charges were not even valid! Most of our numbers were allocated to a separate subsidiary company Andrews & Arnold (numbers) Ltd. This is a company we purchased that had already obtained blocks in every area code. We had intended to move the blocks over, but OFCOM made that difficult saying that the needed to audit all blocks in the process. So instead we bought and renamed the company and A&A(numbers) leased the use of the blocks to A&A. A&A(numbers) stopped doing any services directly. This means A&A(numbers) is not in fact a Communications Provide now (it has no network or services itself, it just provides use of numbering). OFCOM have had to agree that they are unable to charge a non Communications Provider, and so are refunding last year's charges and not charging this year. A&A do have a few blocks, including one for which we pay, but most of the cost was via A&A(numbers), so that is a win! Clearly the trial does not actually meet its objectives, and may be creating actual incentives to use more numbers in conservation areas. It is also incredibly easy to completely avoid these charges with little more than the cost of creating a separate company to hold the number blocks. OFCOM need to re-think things carefully and abandon the trial ASAP. Ever wondered what a floating floor is? Well we have one. Ours is wood (tongue and groove) with ply on top, all resting on top of polystyrene blocks which rest on/in concrete beams and thin air below that. Sadly that is building rubble, and not a secret tunnel to be used in case of zombie apocalypse. Seriously, nothing is fixed down. The polystyrene flexes! The whole floor flexes. 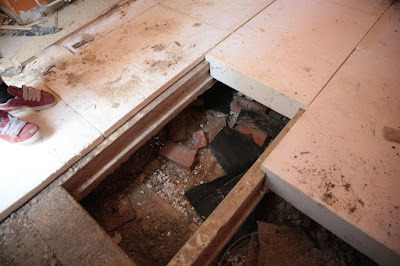 If you want tiles you are buggered - the tiles move and the grout cracks. In our kitchen the installer put a second layer of board on top to make it more solid, but still the tiles are moving enough to crack the grout. 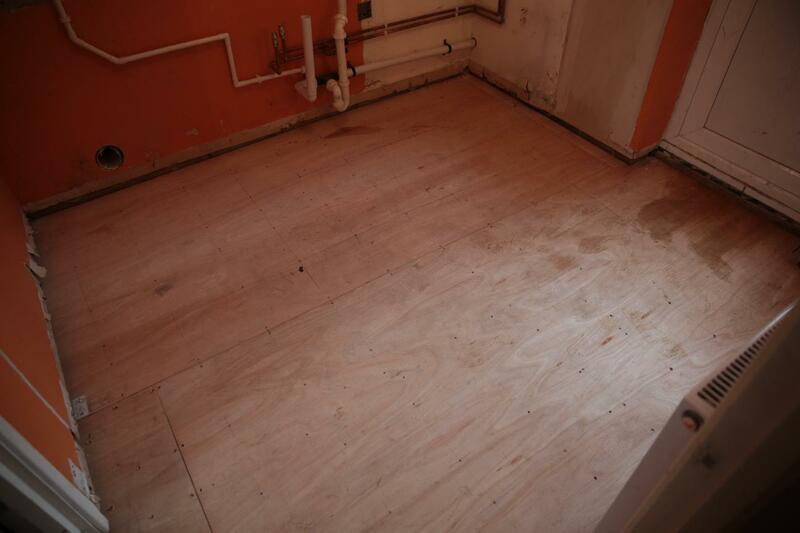 However, for the utility room, we have looked under the wood - it was water damaged so we had to. The solution - thick wooden frames resting in the beams on the lip, and insulation blocks in between. This results in flooring that is actually screwed down to the wood frame and has little chance to flex or move. It is also around 25mm lower allowing some matting and tiling on top which will match the height of original floor it has to join in the hallway. So far so good with these guys, B.W. REED & SON BUILDERS. P.S. Why utility room - what happened to Man Cave? 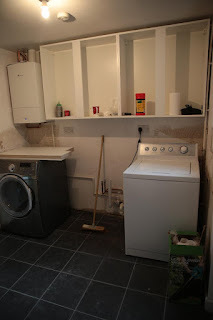 Well I had the boiler moved from the garage to the utility room, and as usual, that means doing the utility room first - floor, tiles, wall, unit, sink, cabinets, the lot. This is how things work isn't it :-) Man cave starts very soon! Obviously that is a tad convoluted, and you might expect the phone to be able to work out keys to use automatically, but it raises serious questions. With end to end encryption any "back door" has to be added by the sender. This means that if, say, someone in China texts someone in America, the sending phone has to add the necessary "back door" keys at the start. Now, US may be able to bully Apple in to adding their keys, perhaps by making US laws, but what if Chinese made laws saying Apple was not allowed to do that when on Chinese soil? Even if you changed it to be a server based solution, what country wants to entrust all message intercepts on such a popular platform to the control and whims of a foreign country - we need end to end encryption to protect us, and countries need to insist on it to protect their citizens. As I also ask at the end of the video - is this only down to the country you are in, or is the sender's (and recipient's) nationality a factor too? How would Apple know that? But then whose keys are included at the sending end, in what circumstances, and by what legal jurisdiction?